I have been using these products for quite a while now, so I have decided to post my ultimate makeup essentials that I pretty much use every day. This foundation brush gives such a flawless finish. I have tried many other brushes before such as the flat or stippling brush, but after using them for a while, I realised that it gave me a very ‘cakey’ and uneven finish and I noticed foundation marks on my skin. However, with this Real Technique brush, it blends in my foundation really well and buffs it out evenly on my face. I highly recommend purchasing this brush as it works well with liquid foundations. This has to be the best foundation for me so far, as it matches my skin tone very well and gives me a good coverage and I hardly ever need to wear any concealer with it. I have used other foundations before such as Clinique and Mac Studio FX, however I realised that it started to make my skin flakey around my nose area, it really did not work with my skin after a while. I have not yet had any problems with this foundation and I am currently on my 3rd bottle, it doesn’t dehydrate or breakout my skin. I think overall its a really good drugstore product and very affordable and 1 bottle actually lasts quite a long time. This product was recommended to me by a friend, and over time I grew to like it more and more. The colour matches my skin quite well so it gives me a natural looking contour. I’ve had this product for only just over a year and have actually hit pan, it gives a matte finish which I prefer over the shimmery bronzers. You can also build up the colour or brush it lightly onto your cheekbones for a bit of colour. The best part of it, is that it comes with its own brush. Words cannot express how much I love this product. I have seen a lot of people talk and hype about this eyebrow pencil and I thought I would give it a try. After using it, it has become one my beauty must haves. It is thin and easy to apply, I have tried ones where the formula is too hard and it hurts to apply onto your skin. It’s a soft crayon which you twist, by doing soft strokes, it gives a very natural and even finish to your brows. The other end of the pencil has a spoolie to blend and even everything out. This is definitely my holy grail product. This product is more on the pricey side, but it was a good investment for me. This was my first Nars eyeshadow palette and I have been trying to get my hands on it for a while. The colours in the palette are very versatile, making it very wearable for day and night. You can create many different smokey eyes or even use a neutral shade for a pop of colour. The formula is highly pigmented making a light dab of colour go a long way. 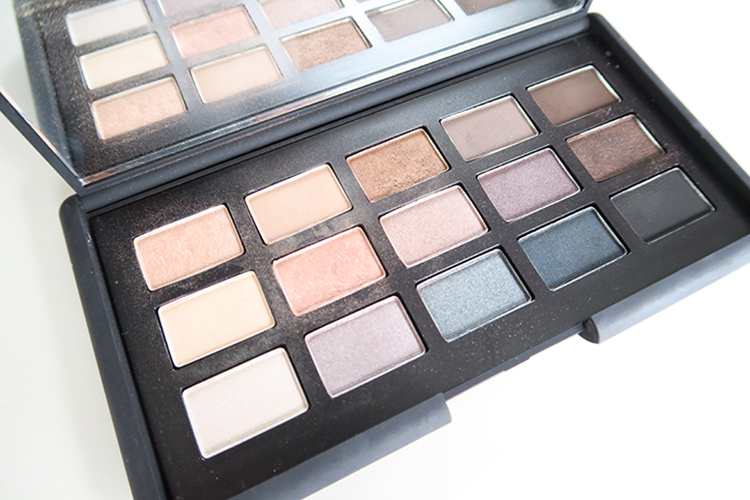 Even though I prefer more matte shades, the colours are really blend-able and it really has become one of my go to palettes. Hope you guys enjoyed this post about my beauty favourites, and let me know what your best makeup products are!